Hello to all my female readers and maybe some of my male readers to! Today I wanted to share with you some new products I am using.. For me, since I live in the south now and the summers are so horribly hot and humid I have a need as soon as the heat hits to turn my daily makeup routine into something I can quickly put on & go but, I also want something that looks good and wears like iron in the heat. I don't want to look in the mirror an hour later and see it all melting down my face..After much searching I have finally found all the products I need..
As most of you know I am or was a QVC junkie.. While I will admit some of their items can be overpriced, when it comes to beauty, some of their deals just can't be beat. My new found love is the products made by Laura Geller Makeup. You can buy Laura's products her own website as well as SkinStore.com but this time I got all my supplies at QVC.com. The reason being was because the prices were lower and you got more product..There are times when QVC will have awesome deals like this. 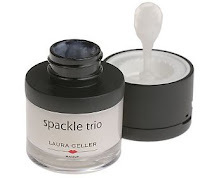 Now that I've told you some great places to get your own Laura Geller products, onto my review. One of the best lessons I learned from watching Laura is you need, yes I said need a good under make-up primer.. Why you ask? Have you ever noticed that after you have put on your facial moisturizer and then your make-up suddenly, within a few hours your make-up needs to be touched up or looks like it's completely gone? The reason for that is while your moisturizer is doing a great job at keeping your face hydrated as well as protected from the sun with it's built in SPF, your make-up is also sinking it's way into your skin. It literally sinks down into your skin along with your moisturizer. Doesn't sound very good does it? I didn't think so either... That is why you must have a great under make-up primer.. My pick is, Laura Gellers Spackle and if you can get Laura Gellers Face, Lip and Eyelid Spackle trio like I did you'll be all set. The face spackle is a silicone based product but it is very lightweight.. When you apply it you will see that it feels cool, airy and not greasy at all. For those who have never used a primer I know that it sounds like something that would feel suffocating but I have not found this at all with Lauras Spackle. Apply the spackle all over your face just like you would a foundation and let it dry. It only takes a moment to dry. You apply this AFTER you have put on your moisturizer. What you have now done is created a barrier between your moisturizer and your make-up allowing your moisturizer to do it's job without sucking in your make-up and your face make-up will last much much longer.. Mine has lasted all day and into the night since incorporating this primer into my routine. Next apply the Eye Spackle. This will not only even out the skin tone of your eye lid and hide any discoloration you may have but it will also allow your eye shadows to last longer because now the color has something to adhere to. Next apply the Lip Spackle. Lip Spackle is great because what it does is fill in all of those fine wrinkles you may have around your lips. You know the ones where after you have applied your lipstick and or gloss you look in the mirror a few moments later and suddenly the product is running up or dripping down into those fine wrinkles and grooves around your lips.. Not only does the Lip Spackle act as a barrier against this, it also allows your lipstick to be true to it's color and last longer because the Lip Spackle evens out the color of your lips and also allows the lipstick to adhere to something.. Lets face it ladies, if you put makeup on and it has nothing to cling to except oily skin you know where its going to end up in a few hours.. Somewhere down around your knees. As for heavy liquid foundations, I can not stand them on my skin in the hot summer. To me it feels like my face is being suffocated and so heavy..I have now changed to Laura Gellers Balance N' Brighten Foundation. 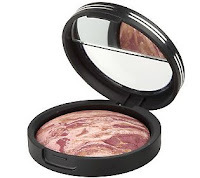 The product is a baked powder. You apply it all over the face with a good make-up brush. It goes on smoothly and evenly and what I like the most is, it does NOT settle into those fine lines and wrinkles we all have after the age of 35.. Especially under the eyes. For those of you reading this article who are 35 and over, if you're thinking to yourself, "I don't have fine lines and wrinkles" my best advice to you would be, honey, get a really good mirror and take a really good look.. It's all apart of aging and save for plastic surgery we all have em..Back to the Balance & Brighten .. All of Laura's baked products are made in Italy. They start out as a creamy mousse consistency and then they are baked in these small terracotta pots in ovens for many hours and what you come out with is this swirl of color in a powder form and the pigmentation is wonderful..They also last for what seems like forever. As for blush. I have been having a hard time the last year or so finding that perfect color. My skin has changed, I am guessing due to age and hormones and no matter what color I have tried, it just did not look right. Either it was barely there, the color was too orange, too pink or I looked like a clown. That is until I found Laura Gellers Ethereal Rose. This is once again, one of her baked products. It's not overly pink, it's not dull. It is the perfect, and when I say perfect I mean, PERFECT color. It makes your face look like you have that soft, dewy, baby pink flush we all wish we held onto from childhood. Laura came out with what she calls Ethereal Balance. This is the product I've been using. 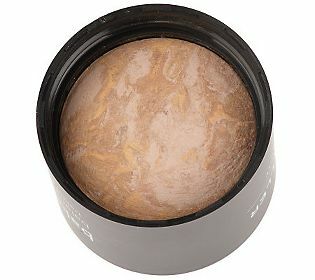 It is the Ethereal Rose and Balance & Brighten Foundation in one split pan. When I use this product, I first apply the Balance & Brighten Foundation half on my face with a brush after I have used her Face Spackle. Then I take the same brush, clean it out a bit and I swirl it in both the Balance & Bright and the Ethereal Rose together and I apply that all over my face including my cheeks and I can tell you, I no longer have the need for blush. This duo together is perfect. 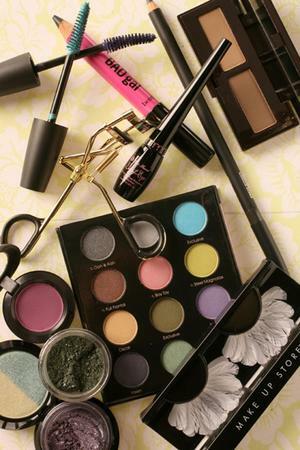 As many of you know there are hundreds to thousands of different eye shadows out there. I think I must have tried them all and wasted a lot of money doing so.. Now, I use Laura Gellers Baked Berry Blush N' Brighten. I put it on my eye lids on top as well as a small sweep under the lower lid and because of all the color pigmentation in the baked products it really makes the color of my eyes pop! Well ladies, that is my make-up review for now I hope you have enjoyed it as much as I did writing it. My next product review will be Laura Gellers Real Deal Concealer. Its made for us gals who have dark circles under the eyes or as its now being called "Tea bag stains".. 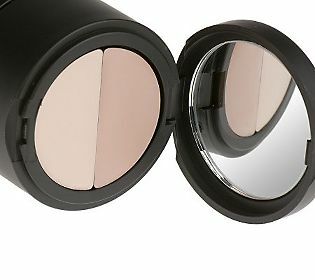 They can be so terribly hard to conceal or cover for many and according to Laura and her many Geller Girls of which I am now one, they all rave about the product. If it's anything like what I have been experiencing with the products I have been using thus far I am sure, this will be the one to do the trick. Also, if you go to QVC.com you can see video of Laura and each individual product as she demonstrates on women how to use the item.. Very helpful tips.